Dworshak Dam is solid and not in danger of failing. So say officials from the U.S. Army Corps of Engineers. The dam's recent poor safety rating has more to do with its location and the severe downstream consequences that would occur should the dam fail than it does with the actual chances of such a catastrophe. Corps officials are reluctant to share the details of what might happen if the dam fails. They say doing so could cause undue fear. "Things like that, if taken out of context, can really cause problems," said Greg Parker, operations manager at Dworshak Dam. "I think it's common knowledge out there that there would be impacts down to the Tri-Cities. What is the probability of that happening? It's not probable." The corps' emergency action plan for Dworshak Dam and Reservoir includes inundation maps showing what areas would be under water from Orofino to the Tri-Cities, should the dam be breached. Those maps show much of downtown Lewiston and the northern and western edge of Clarkston under water. Nearly 30 years ago, corps officials released flood predictions to the public based on the hypothetical scenario of one of the dam's 51 monoliths failing. Such an event would let loose flows estimated at 1 million cubic feet per second. Floodwater would travel about 25 mph and reach Lewiston after about two hours. After four hours, lower-elevation areas of Lewiston and Clarkston would be under 38 feet of water. But places like Normal Hill and the Orchards would be high and dry. Any problem at the dam would trigger a chain of phone calls to warn downstream communities. According to emergency plans in place for more than two decades, officials at the dam would call counterparts and the agency's district office in Walla Walla. Officials there would then call emergency personnel in places like Orofino, Lewiston, Clarkston and the Tri-Cities. 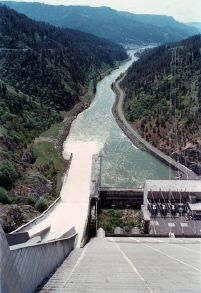 Having off-site personnel handle the warning calls would free up officials at the dam to attempt to stem the disaster. "I don't want them making those phone calls," said Jeff Stidham, chief of emergency management for the Walla Walla district. "They call two people and those people call everybody else." The corps maintains an updated list of emergency contacts. "If there are any problems, even a minor problem, the safety folks at each of the dams make two (types of) calls - one to the sheriffs of downstream counties and one to emergency managers of downstream communities," said Mel Johnson, emergency coordinator for Nez Perce County. "They have 24-hour contacts and so that procedure is pretty much in place. They do call down one to two times a year to test the call-down system." Johnson said the plan is based on worst-case scenarios and gives emergency officials like him vital pieces of information to act on. "One is what areas would be affected and that would tell us what areas we would have to evacuate. We would start low and work high. The second piece is how much time do we have," Johnson said. "It's highly unlikely but we do practice it, not just the calls but the emergency actions." The corps is in the midst of updating its 1982 emergency action plan for the Dworshak project. Stidham said the plan should be completed in the next year. In the meantime, the old plan remains in place. "We will refine it as time goes on," Stidham said.